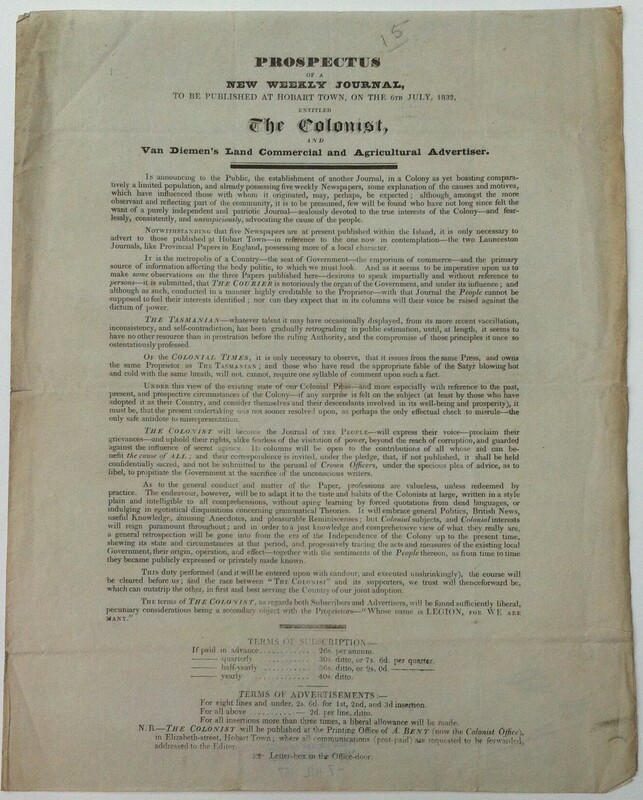 Prospectus of a new weekly Journal to be published at Hobart Town, on the 6th July 1832 entitled the Colonist, and Van Diemen’s Land Commercial and Agricultural Advertiser. 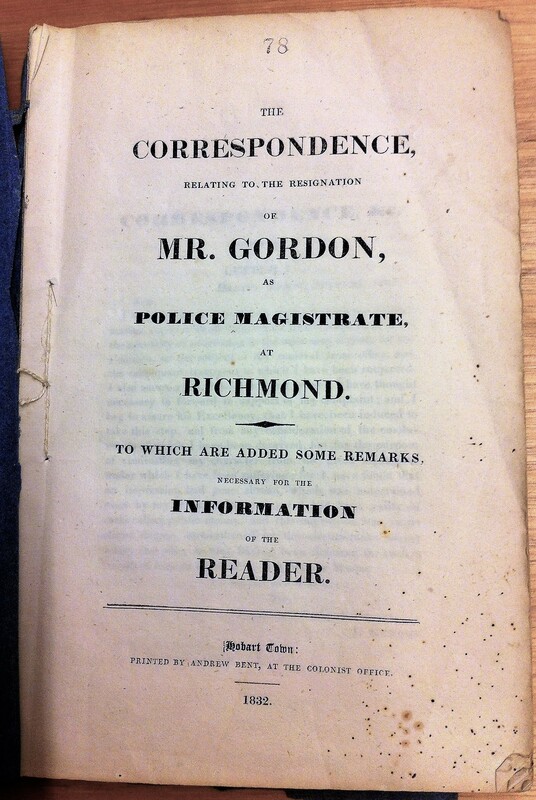 The Correspondence, relating to the Resignation of Mr. Gordon, as Police Magistrate, at Richmond. To which are added some Remarks necessary for the Information of the Reader. Hobart Town: Printed by Andrew Bent at the Colonist Office. 1832. 48p., 8vo. Dark blue paper wrappers. The real author was probably, as Arthur believed, Gilbert Robertson, who was until Nov. 1832, editor of the Colonist. A brief account of the trouble this pamphlet caused both Gordon and ticket of leave convict Henry Savery is given in Gordon’s entry in the Australian Dictionary of Biography. 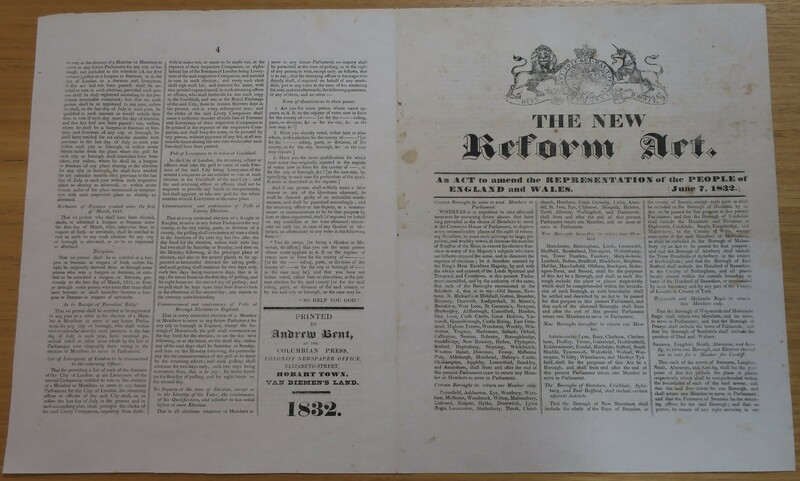 The new Reform Act. An Act to amend the Representation of the People of England and Wales. June 7, 1832. Printed by Andrew Bent, at the Columbian Press, Colonist Newspaper Office, Elizabeth Street, Hobart Town, Van Diemen’s Land. 1832. Publication announced in the Colonist 16 Nov. 1832. Price 1s. Copies were still on sale at the end of 1833 at the reduced price of 6d. 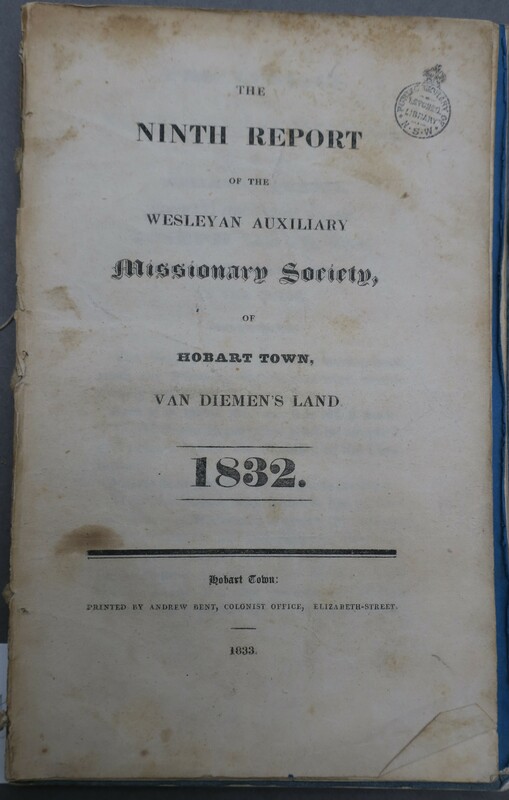 The ninth Report of the Wesleyan Auxiliary Missionary Society of Hobart Town, Van Diemen’s Land 1832. Hobart Town: Printed by Andrew Bent, Colonist Office, Elizabeth-street. 1833. 28 p., 21 x 13.5 cm. Blue paper wrappers. Contents: Proceedings of the ninth annual meeting p -5; ninth report -16; List of donations -27;  accounts. The report was ordered to be printed at a meeting of the Society on 31 Dec. 1832and was noted as just published in the Colonist 14 May 1833.